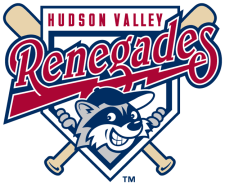 The Hudson Valley Renegades kicked off the season by going 5-5 on the week. They are currently in second place of the New York-Penn Leagues McNamara Division, 1 1/2 games back from the leader. Transactions: Mayobanex Acosta added to roster from Bowling Green (6/22/10). Diogenes Luis added to roster from Bowling Green (6/24/10). Phillip Wunderlich added to roster (6/25/10). Bennett Davis promoted to Bowling Green (6/25/10). David Wendt promoted to Bowling Green (6/25/10). The Week Ahead: 6/29/10: vs Brooklyn Cyclones (7-4). 6/30/10: at Brooklyn Cyclones (7-4). 7/1/10-7/3/10: vs Aberdeen Iron Birds (5-6). 7/4/10-7/5/10: at State College Spikes (5-6). Who are the top prospects we should watch here? There's a ton of big-name prospects here outside of 2nd rounders Derek Dietrich and Jake Thompson(who has yet to debut). Brian Bryles is the toolsiest player, but hasn't really put them together. Oops, that should say there's NOT many big-name prospects besides Dietrich and Thompson.